There are tons of fishing games available for Android on Google Play Store. But, only a few of them really worth a try. We have made it easy for you, you don’t need to check each game, just check out the list of best fishing games for Android below and enjoy fishing on your mobile screen. Fishing Strike is a new and one of the best fishing games for Android 2018. If you are looking for an action-packed fishing game, then you should give it a try. There are lots of destinations featured in the game where you visit and catch fish. The players can collect over 500 types of fish; rare, common, legendary, epic. Sell them for coins, buy new equipment, upgrade your gears, anglers, and enjoy the best fishing experience on the mobile screen. Another best thing about this game is it features multiplayer battles; you fight against other players in real-time, can you defeat other players? It is one of the best games I have ever played. It’s challenging, addictive, realistic, and awesome. Download – Here[Google Play Store]. Want to know more about this game? Check out the overview here or some tips and tricks here. Fishing Adventure by Owings is among top best fishing games for Android 2018. In this game, you hunt fish using harpoons, use skills and complete the fish collection. It comes with a small MB pack; 29 MB and features amazing graphics, good addictive gameplay, smooth controls, and challenging stages. Upgrade your boat, catch fish and place them to fish farm. Fishes in the fish farm automatically generate gold and you use gold in upgrading. Fishing Adventure game was released at the beginning of the last year and has crossed over a half million downloads on Google Play Store with 4.6 rating, that’s really good! You should give it a shot. Download – Here[Google Play Store]. Desert Island Fishing is a wonderful game for mobile devices, by Springloaded Ltd., the creators of The Last Vikings game. If you are looking for a fun, simple, addictive fishing game, then you should try out this one. Its gameplay is really fun, addictive, and challenging. The game features 7 Islands+hidden, lots of upgrades, hundreds of fish to find, and much more. The size of this game is around 30 MB, it has crossed over a half million downloads on Google Play Store with 4.4 ratings. Download – Here[Google Play Store]. Fishing Hook by mobrix is the best fishing game for Android. There are plenty of things to do in this game; catch some rare and big fish, sell them, add to your tank, go to famous places and show your fishing skills. The game offers realistic graphics and gameplay. Another best thing is you can play this fishing game offline, as it does not require the network connection. The number of downloads is over 10 million on Google Play Store and has 4.4 ratings. Download the game – Here[Google Play Store]. Price – Free(Contains Ads, In-app purchase). 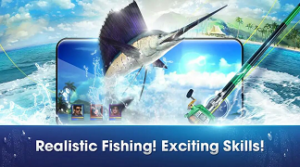 Fishing Clash is one of the highest rated fishing game for Android on Google Play Store, featuring a variety of fish, real-time player vs player mode, lots of challenging missions, and much more. It has crossed over 1 million downloads on Google Play Store and has 4.8 rating, that’s marvelous. One of the best things about this game is its graphics and amazing intense gameplay; you will enjoy the realistic fishing experience on the mobile screen. I would recommend you try it out now. Download – Here[Google Play Store]. Monster Fishing 2018 is an offline fishing game for Android by Nexelon Inc. The game features more than 250 species to find and collect, awesome 3D graphics, amazing gameplay, and challenging missions. All you need to do is collect, earn, upgrade, and repeat. Upgrade the gears to catch rare or epic fish. It’s a fun simple game and you should give it a shot. Download – Here[Google Play Store].